“The scene takes place in what is now known as the Battery, with ships on the horizon. The tribesmen wear loincloths, and their heads are adorned with feathers. A few Lenape women can be seen in the background, undressed to the waist, in skirts that brush the ground. They keep their heads down, dutiful. In front of a windmill are two fully clothed Dutchmen, one of them resting a rifle on his shoulder. The other, Peter Stuyvesant, colonial governor of New Netherland, is graciously extending his hand, waiting to receive offerings brought by the Lenape. 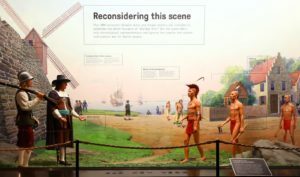 About a year ago, the museum asked Mr. Pecore to help solve the diorama problem…The solution offers a lesson in the changing nature of history itself. And it’s written on the glass. While the scene remains intact, 10 large labels now adorn the glass, summarizing various issues. They were carefully chosen after a research process that took most of 2018. The labels say, for instance, that if the scene had been historically accurate, the Lenape would have been dressed for the occasion in fur robes and adornments that signified leadership positions. The women did not wear impractical skirts that dragged behind them. 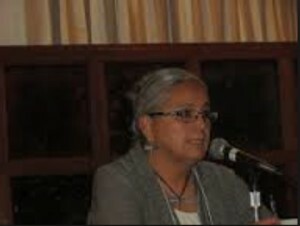 Further, some are likely to have been part of the negotiations, as women in Lenape societies (past and present) typically hold leadership roles. 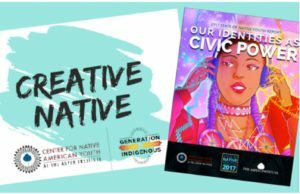 “The Creative Native call for artwork is an initiative that supports young Indigenous artists ages 5 to 24-years-old and provides the opportunity to receive national recognition, funding for art supplies, and a $200 prize. Art submissions must answer the question: What does Generation Indigenous mean to me? Submission photos and images will only be accepted electronically through the online Creative Native Entry Form. Submissions will be reviewed by an independent review committee, which will select one awardee from each age category: 5-9-year-olds; 10-14; 15-19; and 20-24. Examples of submissions can include, but are not limited to paintings, drawings, photography, sculptures, and traditional works such as beadwork, carvings, and baskets. Artists can submit a maximum of three entries. Artists will need to submit separate forms for every entry. Artists may submit up to three (3) images of each artwork, displaying alternate angles and perspectives. Submissions are due at 11:59 pm Eastern Time on May 9th, 2018. Click here for a complete list of Rules & Guidelines. Click here to submit your art. If you have any questions, you may contact del.curfman@aspeninstiute.org. More than two years ago, Learned tapped multi-media artist Joe Hopkins to help him bring Native Pop to life. 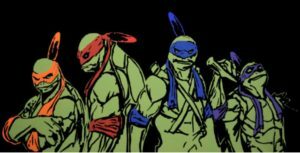 The pair compared lists of the best pop artists in Native circles, starting with the most prominent names in the pop art world in Indian country, like Bunky Echo-Hawk, Steven Paul Judd, George Curtis Levi, Joshua Garrett, J. NiCole Hatfield and Oneka M. Jones. Each artist brings a unique style to the table. 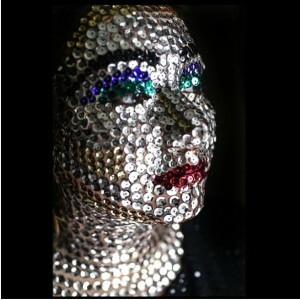 They’re very sought-after artists, and not only that, their craft is well defined. 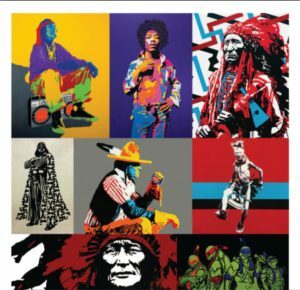 Beyond tribal affiliations, the common thread between the various Native Pop artists is pop art. Learned and Hopkins are quick to point out the distinction between pop and contemporary art. The two genres can get “cluttered,” Hopkins said. “It’s a fine line.” Pop art employs popular or iconic imagery, whereas contemporary art is less well-defined and generally ascribed to works by artists living today, art related to modern-day themes, or art created through new mediums. 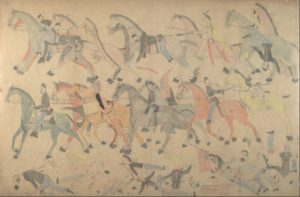 Drawing by Red Horse, “Untitled from the Red Horse Pictographic Account of the Battle of the Little Bighorn” (1881), graphite, colored pencil, and ink. 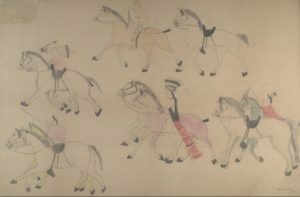 “Red Horse, who surrendered the year after the battle, was living on the Cheyenne River Agency, a reservation in South Dakota, when he made the drawings. He spoke no English, and his initial account of the battle to American officials was delivered through Plains Indian sign language — coded hand signals that Native Americans on the Great Plains used to communicate across tribal lines. He later made the drawings with colored pencil and pen to help researchers check the accuracy of the interpretation of his sign-language testimony. But I think that the drawings are the real Red Horse testimony — more direct, eloquent and moving than the translation. 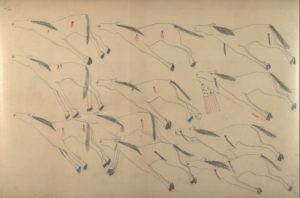 These drawings, housed at the National Museum of Natural History in Washington, are the Little Bighorn through Lakota eyes. In one, of Last Stand Hill, where Lt. Col. George Custer and many of his Seventh Cavalry troopers were overwhelmed by Lakota and Cheyenne warriors, Red Horse displays his pride in the Native Americans who shot bullets and arrows into fleeing cavalrymen, pulled soldiers off horses or stabbed them with spears. The cavalry horses appear in columns of two, mostly bluish-gray in the front row and sorrel in the back. This color coordination was not a figment of Red Horse’s imagination. Custer had issued a coloring of the horses order, forcing cavalrymen to trade horses with one another so that each troop company rode mounts of a uniform color. Red Horse’s drawings are brutally honest and honest about brutality. His depiction of the scalped and mutilated bodies is an uncensored portrayal of the consequences of revenge and hatred. In an era in which the Islamic State beheads its enemies, it is worth remembering that mistreatment of prisoners, mutilation and taking of body parts was once common in warfare. The Third Colorado Cavalry Militia killed more than 200 Cheyenne men, women and children in the 1864 Sand Creek Massacre, taking body parts and scalps and waving them for the crowds in their victory parade in Denver. 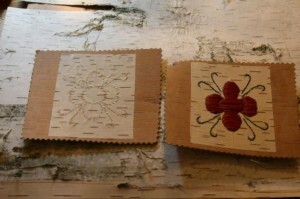 “Birch bark biting was a pre-contact method of creating designs for beading or quillwork according to Lajimodiere. Mazinibakajige died out in my tribe until I began doing it about eight years ago, she said. She carefully separated the layers of bark, almost holding her breath as she peeled the delicate onion-skin-like layers so they don’t tear. 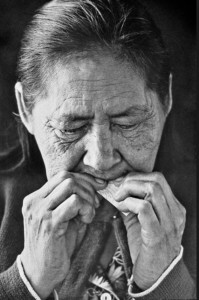 She folded a layer of bark into a triangle and began to bite a design with her eyeteeth. Biting quickly, sounding [like] a chipmunk chewing through wood, she creates elaborate flowers, dragonflies and turtles. She held the finished work up to a lamp so the design could shine through. You tube: Dale Kakkak talks with Denise Lajimodiere who was teaching Birch Bark Biting at the 3rd Nagaajiwanaang (Fond du Lac) Language Camp. Denise demonstrates how to prepare the bark and how create the design you want. Lajimodiere, an assistant professor at North Dakota State University School of Education as well as a poet, sells her designs as earrings, wall hangings and other forms. 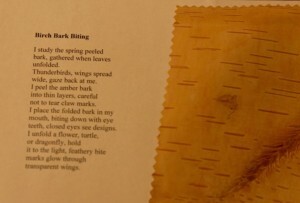 Birch Bark Biting poem by Denise Lajimodiere from her book of poems “Dragonfly Dance. 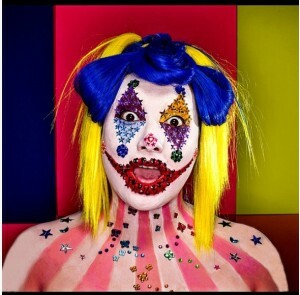 Artist Does 100 Days of Makeup! “So for the past few months, every day, Muro has been posting a new identity of sorts on her Instagram and Flickr accounts. Some days she’s a gruesome tooth fairy or voodoo doll. She’s also been Wonder Woman, Freddie Krueger and a Party Leopard. 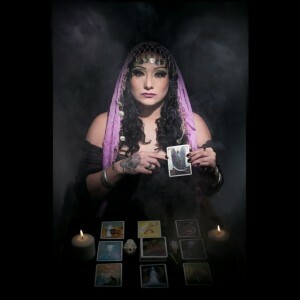 These elaborate transformations are second nature for Muro, who has served as a makeup consultant, costumer and even monster maker for various Halloween-themed attractions, including Field of Screams. and the annual Terror Behind the Walls attraction at the Eastern State Penitentiary. I remember when I was around Day 30 I was like, ‘This is impossible. What did I get myself into?’ she said. Now that she’s past the halfway point, however, the project doesn’t seem that insurmountable. How long a particular image takes Muro to complete depends. ‘I’ve had some looks that can take 30 minutes and some that took 10 hours from concept, research to completion,’ she said. “The true work of art is but a shadow of the divine perfection”.